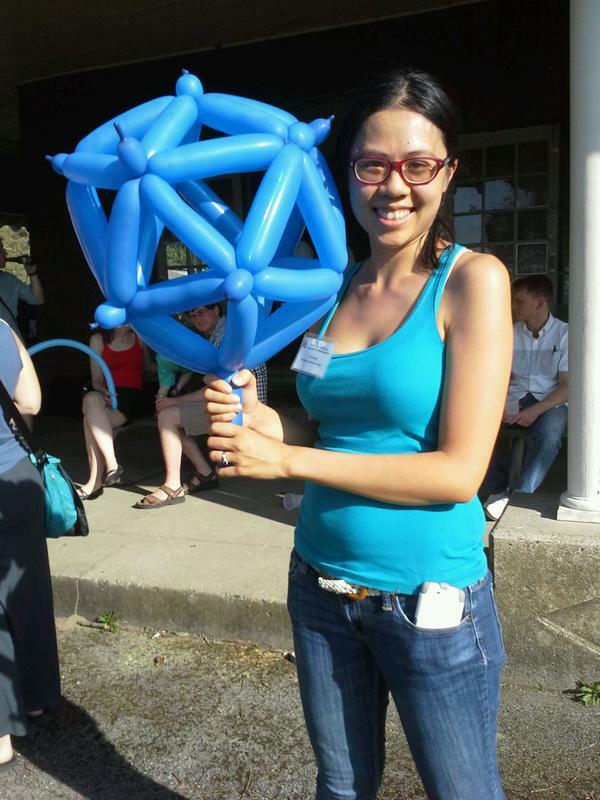 Last weekend I had a wonderful time at the Cornell Topology Festival- I went because my internet and now real life friend tweeted about it! Good things can come out of the internet! I might be impulse-registering for the Cornell Topology Festival! Start from the top vertex. If you follow the a arrow right and the b arrow up, you’ll end up at the bottom left vertex. 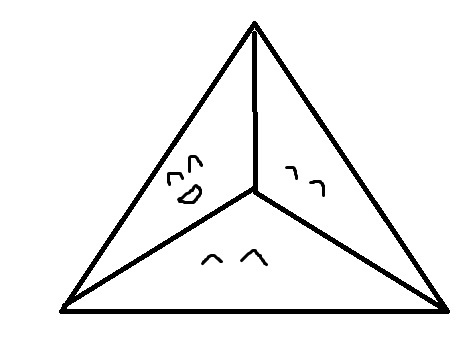 This tells us that we should label the edge from the bottom left vertex to the top by ab. Now we add the blue triangle in to the big triangle. There are two different ways to read the last face, and that fact means that those two expressions better be equal. This is associativity. So you can think of prees as partial multiplication tables, and they determine a graph. But I tagged this post “group theory”, and prees do relate to groups. In fact, it’s a theorem that any finitely presented group (see here for reminder of definition) is a universal group of a finite pree. This group is defined as having generators equal to the elements of the pree, and relators are the products of the pree. Here’s the first example. If your pree (which is a set with partial multiplication) consists of two groups K and L which share a subgroup A, then the universal group of that pree is , the free product of K and L amalgamated over A. If you don’t know what that means, don’t worry about it. We’ll do amalgamated products some other time and I’ll add a link here for that. You can also do this with letting your pree be a graph of groups, and get the correct corresponding group. Something whacky! This isn’t an open problem, but an undecidable problem: whether a finite pree embeds in its universal group (this means that there’s a function sending the elements of the pree into the group which respects the pree multiplication and doesn’t send two different pree elements to the same group element). So even if you might be able to tell, given a specific pree, whether it embeds in its universal group, there’s no algorithm that works for all finite prees. Here’s one of the main theorems of the talk: if, every time you have a collection of elements that can be put together to form a triangulated rectangle or pentagon, as in the picture below, one of the orange lines exists, then the resulting universal group is biautomatic. Remember, prees only have partial multiplication. So in the rectangle case, if we have ab and bc along the diagonal, the orange line means that ac also exists. Like you, dear reader, I also don’t know what biautomatic means, and Gilman didn’t explain it during his talk. But he did draw lots of pictures of this sort-of group-like thing. Here is a survey article on prees. On deck if I get around to it: more blog posts from this conference- talks by Denis Osin and Mladen Bestvina. Also, I really need to bake something new. I’ve made that super easy lime pie a bunch by now; I even made it at this conference with ingredients from a mini-mart. 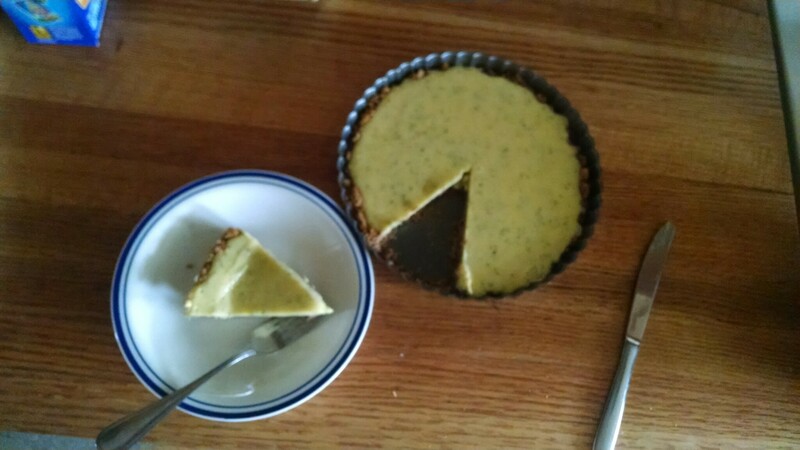 The limes had no juice so this was mostly a sweetened condensed milk pie, which was still delicious but too sweet.